Would you serve smoked oysters at your next cocktail party? Not the first thing that springs to mind? Once considered a luxury item, and served on salty crackers, smoked oysters were actually an hor d’oeuvre staple of the 1950 and ’60s. Then somehow, they fell from grace. Some blame the 1971 film, Stork, during which the lead character extracts one from his nose during a cocktail party. But maybe with an explosion of other food products available in later decades, our palates just became more discerning. The tinned variety is still available in most supermarkets, but all commercial brands now come from China or Vietnam. These oysters are mass-produced—boiled until they are safe to eat, smoked and then seeped in slimy oil and tinned. What results is a hit-and-miss, deep yellow-brown wrinkled oyster with the texture of a bullet with a metallic and often chemically taste. 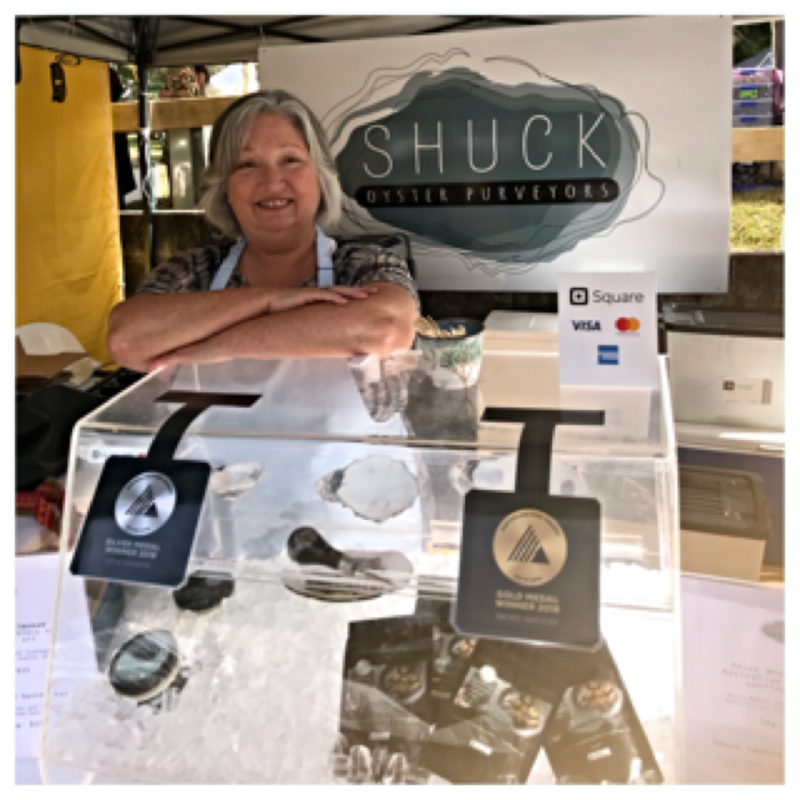 Now, however, there’s an alternative in Australia: self-confessed ostreaphile Lucy Ashley’s artisan smoked oyster brand, Shuck Oysters Purveyors, which had a stall at the 2019 Sample Food Festival in Bangalow. The bubbly and personable Ashley relocated to the Northern Rivers region in 2004. She had a long association with Byron Bay and wanted to raise her son away from the pressures of city life she had come to know. An established career in advertising soon morphed into her passion for all things oyster. She knew the reputation of smoked oysters needed to change. So, she bought a smoker to test the waters. Then, in the summer of 2013, she set up a pop-up oyster store in Byron. After two years of recipe-testing on devoted friends and lots of positive feedback, Shuck was born. Ashley sources only top-quality Australian Pacific or Sydney Rock oysters. They arrive fresh and are shucked and brined with an infusion of secret native botanicals, with a hint of aniseed. Then comes the smoking over natural woods, just to the point where they are cooked enough to be safe to eat, but still retain their oystery, smoky flavour, creamy texture and plumpness. Finally, the oysters are packed in pouches with sunflower oil, which Ashley uses because it does not impart any flavour. 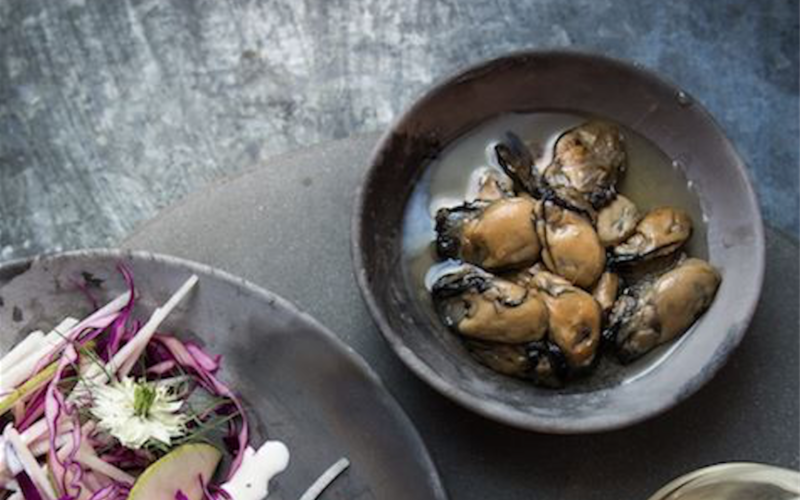 A taste of Shuck’s smoked oysters immediately fills your mouth with a pleasurable burst of smoky umami flavour, with no hint of the metallic taste of the tinned variety. The colour is a lustrous chocolate brown, the texture slightly chewy, with a creamy centre. Ashley’s oysters are also versatile; they can be eaten on their own or added to enhance dishes such as pasta and salads. The other product on offer at Shuck is a smoked oyster pate, which is smooth and silky, balanced with a brush of the briny sea and a pleasurable umami taste that lingers on your palate. It’s a perfect condiment for steak sandwiches or as a spread on toast. Not many people know that oysters are super foods—they contain the highest source of zinc per serving than any other food, as well as omega-3 oils. Ashley has regulars who visit her weekly stall at the Ballina Farmers Market to purchase their week’s supply of her nutrient-dense smoked oysters. Both of her products have a shelf life of 40 days and can also be bought online and shipped by overnight post in a polystyrene box. Things are not standing still at Shuck. Ashley says she has two more products ready for launch before the end of the year: whole-smoked, flavoured oysters and a smoked oyster salt. After signing a deal with a new distributor, Ashley’s oysters will soon be available in gourmet shops across the Eastern seaboard, as well. With Gold and Silver medals at this year’s Australian Food Awards, this once ostracized delicacy has come of age and now deserves a place at every gourmet’s table. This story was produced as a part of “Eat Your Words by Le Cordon Bleu,” an immersive workshop on food and wine writing for new writers. The 8th Annual Sample Food Festival Wrap Up!